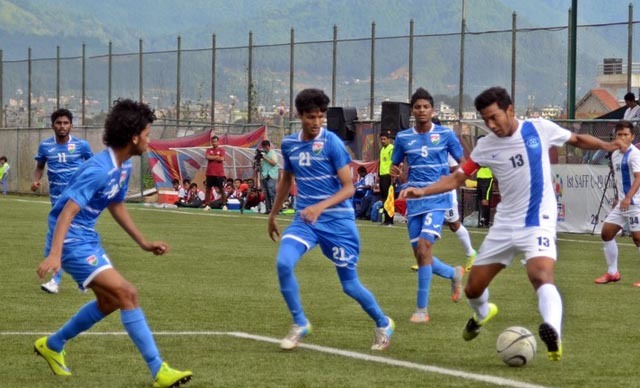 LALITPUR: India advanced to the semi-finals of the SAFF U-19 Championship with 3-0 victory over the Maldives in their last league match at the ANFA Complex on Tuesday. India lead the group with six points, while Afghanistan are at second with three points. With today’s loss, Maldives crashed out of the tournament without a point. India will face Bangladesh in the semi-finals, while Nepal will take on Afghanistan scheduled for Thursday. 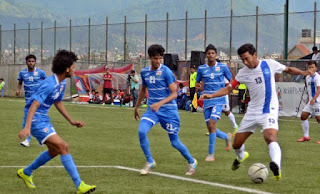 Moinuddin, Lalramzuava Khinangte and Anirudh Thapa scored a goal apiece to guide their team to victory. India took lead in the match through Moinuddin’s goal in the 41st minute. Maldives had chance to level the score as they were awarded spotkick after India’s Kamalpreet handled the ball inside the danger box. Hassan Ibrahim Atheeq, h however, shot the spot kick wide though the goalkeeper had dived in the wrong side. India doubled the lead through the goal of Khinangte in the 47th minute after he made a powerful shot off Daniel’s cross. Thapa killed the match for Maldives as he scored in the 71st minute after receiving a low cross from Prashant Karuthadathkuni.